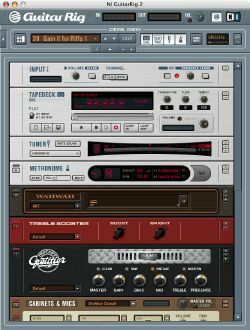 When Native Instruments first announced Guitar Rig in June 2004, I more or less dismissed it straight away as yet another failed attempt towards the holy grail of software amp/fx modelling. I took the animated NI executive’s enthousiastic presentation at Apple’s WWDC as the archetypal marketing talk, and I obviously didn’t get a feel for the quality of the software through the poor audio of the webcast. It was only about 6 months later that I decided to download the demo of Guitar Rig and play around with it. I had a M-Audio preamp for use with my mac, and my trusty Ibanez was right there waiting for me to play. Several months later, late in the summer of 2005, I took the plunge and bought Guitar Rig. A short while later, I received a complimentary version of Guitar Rig 2 — I was very lucky — as I had purchased the first version right before the second one had been announced. I never expected to be so pleasantly surprised by a modelling application and I can now safely say that Guitar Rig has really improved my playing and studying experience with my electric guitar. Ever since 1994, when I first started playing the electric guitar, I always found myself dissatisfied with the tone I was getting from my gear. I stood there dreaming of the gear that I would ideally like to have at my disposal. Gear that would allow me to reproduce the tone and practise on techniques used by the best guitarists around. Unfortunately, being able to reproduce that kind of tone usually requires powerful, expensive head tube amps with large 4x12s, and a rack of effects, good mics, and the appropriate soundproof real estate to put all that stuff in. Yep, back in 1994 it was just an intangible dream. Even today, while I could buy most of that stuff, I’d have nowhere to store them, let alone use them in. NI has managed to release an amazing piece of software (and pretty decent hardware) with its Guitar Rig software and significantly improved modelling, a wider range of components, amps, fx and features along with a greatly improved foot controller with Guitar Rig 2. The electric/acoustic guitar press, usually quite wary of computer based products, was pretty excited too. Practically all highly respected guitar publications in the US and Britain gave Guitar Rig the highest possible score when reviewing it. They all gave it the ‘Editor’s Choice Award’ (or equivalent) too. But why exactly is it that great? Well, besides its amazing sound fidelity — in most cases it matches the original to a considerable degree — it has a very well thought out rack-based interface that encourages — and simplifies — experimentation and complex setups, otherwise impossible (without an unlimited supply of FX units, that is, and patience in finding, testing and connecting all those devices with cables). Version 2 added more Amps, Effects units, cabinets and mics, a loop machine (particularly useful for studying scales and improvising and modifiers (as found in many a synth products). Guitar Rig 2 boasts a very impressive array of — mostly — vintage amps (although that does not mean you cannot recreate modern rock/pop/metal/jazz etc. sounds) including emulations of the JCM800, the Mesa Boogie Rectifier, AC VOX, Fender Reverb among others along with 25 cabinets and 9 microphones, an array of classic Boss pedals, the Crybaby, octaver and pitch pedal, two delays and two reverberation units, three EQ units (shelving, paramteric and graphic) and many others, but it also allows arbitrarily complex combinations of them in separate chains. The only complaint I have about it is the quality of the presets. Guitar Rig 2 comes with about 500 presets, most of which leave me cold and do not do the program justice. While this is by no means an important defect — you can always, and probably will if you’re using the software, make your own presets — it is the one thing I found that could be improved. NI has a site for registered users where you can download and presets, although last time I checked there weren’t that many listed there. If you are a GR2 user, and know of a site that hosts and accepts GR2 presets, please leave a comment below! I think GR2 is probably the best thing I’ve seen for electric guitar and is a dream come true for all those that wish to have the power to control their tone, beyond the hardware limitations of their existing amplifiers, cabinets, microphones, FX pedalboards, and FX units, in vastly more complex and interesting sound chains. While there has been a series of modelling products for the guitar since the mid-90s (remember Roland’s COSM?) with products such as Line6’s POD making a lot of noise when they came out, I never felt comfortable using any of them, partly due to their inability to provide convincing tone — most of the time — and partly because their interface to the user was completely unnatural and frustrating. 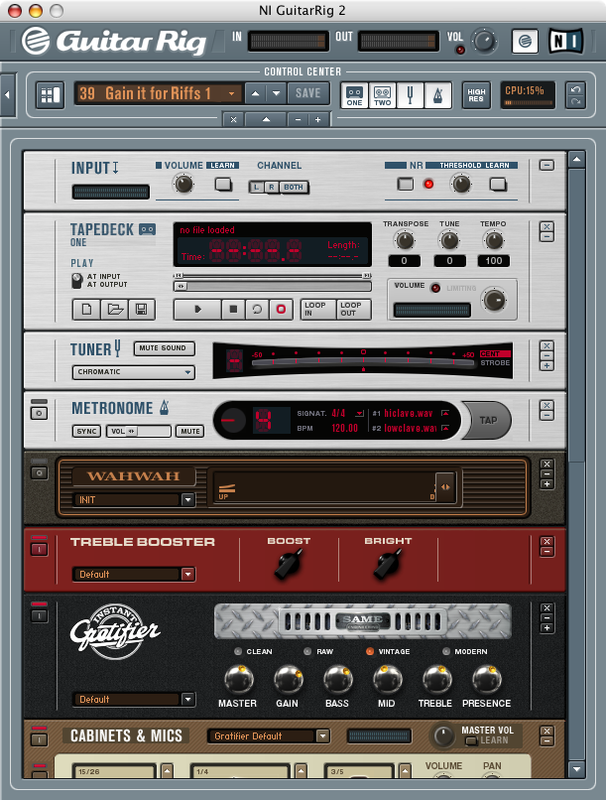 Guitar Rig 2 is available for Mac OS X (PowerPC, Intel version is coming out now I think. Us older users will have to shell out €25 for it) and Windows. It costs about €450 (including the USB2.0 foot controller/DI box) but you may be able to find it cheaper in some online stores. In any case, if you are an electric guitarist, whether a professional or an amateur, give Guitar Rig 2 a go by downloading the demo today. It’s most definitely worth it. I am in no way affiliated with Native Instruments or any other corporation mentioned in the article. For additional information, also check the cosmix.org Guitar Rig 3 review available here. Some of the content/imagery/multimedia in this article is used in accordance with U.S. fair use doctrine or equivalent in other jurisdictions. cosmix.org | Guitar Rig 3 is out!